Graze the Roof: Bees and Basil! The morning and early afternoon sparkled! Warm sunshine and bright blue skies supported the freshening of garden beds and the spring planting of six different varieties of heirloom tomatoes and basil plants, as well as dozens of sweat pea plants delicious fava beans!!! Thank you to Purple Carrot, Flatland Flower Farm and Occidental Arts and Ecology center for your donations of fava beans, carrot seeds, pea plants and the robust and vibrant plant sales over the weekend where much of our new plants have come from! As we were enjoying a picnic lunch at the center table, nursing students from the health clinic joined us, and we found ourselves in joyful conversation. It is wonderful when the greater Glide staff community makes use of the rooftop garden, as a place to harvest seasonal produce, learn new skills, develop appreciation for the natural world and growing cycle as well as build community!!! Paul Koski, our resident Bee Keeper, called as we were finishing lunch and said he'd drop by to install the bees!!! We were thrilled and prepared for Paul's arrival. He came with a wooden bee box(hive) all taped up. He said this infant bee colony had been settling into this new hive for about a week. 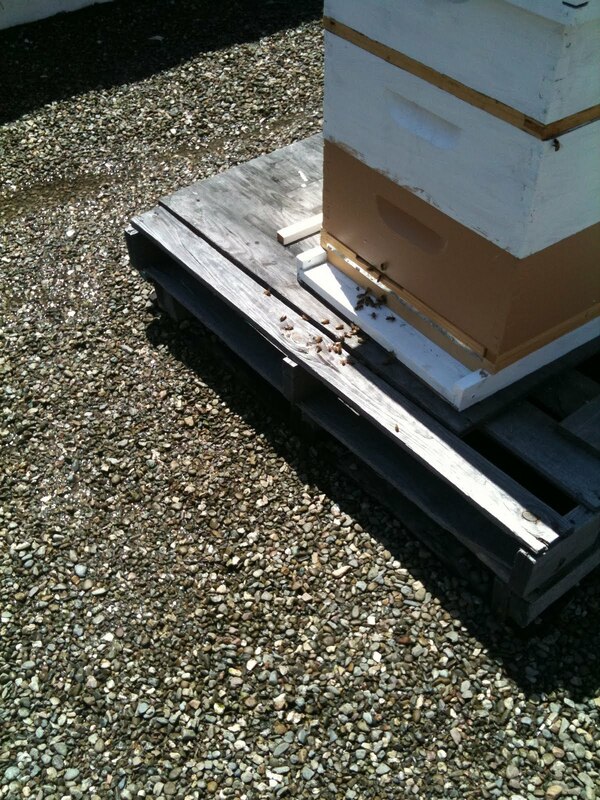 Paul informed us that an infant bee colony such as ours, most likely holds 7000-7500 bees!!! This colony could support up to 60,000 bees! Wow! As we were observing the bees during the installation, we discovered the queen and lots of healthy larvae. Paul will come back to check on the bees in about two weeks!